To the Bluemont General Store, of course, where the bowtie- and blazer-wearing singers were supplied with any number of laying hens as lively props for a photo shoot to produce advertising pictures for the chorus’s Valentine serenades. 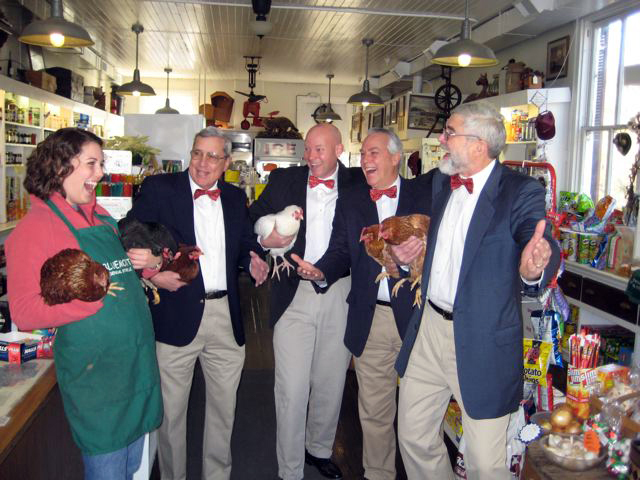 The Chorus of the Old Dominion, a men’s singing group named after the Washington and Old Dominion Railroad that once traversed Loudoun County, specializes in a cappella (unaccompanied) music: barbershop, gospel, show tunes, and doo-wop. They entertain at events around the county. Valentine’s Day is the highlight of the year for the group, when quartets fan out to deliver live-performance singing Valentines at homes and workplaces on the day before and the day itself (February 14th). Sentimental classics, such as “Let Me Call You Sweetheart” or “Heart of My Heart” are most often chosen. 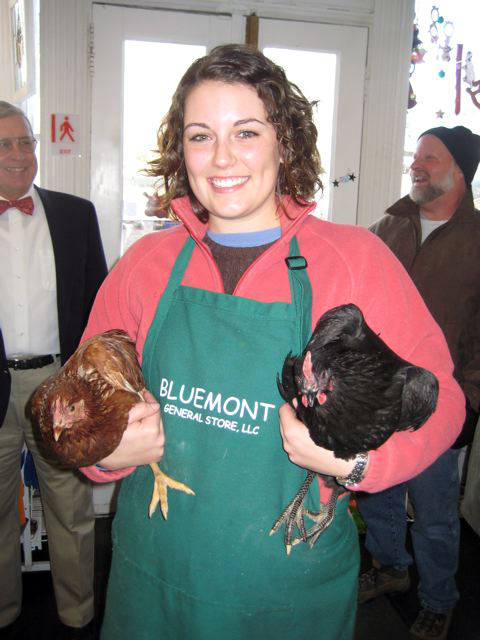 Wyant was also drawn to the Bluemont Store by his long-time friendship with co-owner Lani Newcomb. When Lani was seven year old, Wyant began working for the Newcombs at Potomac Vegetable farms, on Route 7, five miles west of Tysons. The Newcombs still sell produce to the public at that spot and take part in other local farmers markets. “The first time Lani drove, she drove my pickup over a cornfield,” Wyant recalls. Cost of a singing Valentine is $50, which includes a red rose, a “special card,” and a photo to remember the event by. The group was founded in 2002. 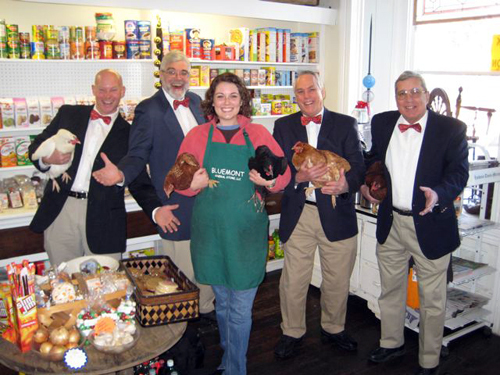 In 2005, the chorus qualified for the Barbershop Harmony Society's District Championships. They meet on Thursdays at 7:30 at the United Methodist Church in Leesburg. Even the flyer is funny. Bluemont Store clerk Courtney Hall. Photo by David Levinson.